So over a year ago I lost my phone. This meant I lost my cache data. Randomly today I had a Facebook memory from about 2-3 years ago where I shared my WordPress page as part of a college project. So user name found so I could now reset my password. I occasionally run after school art groups. I am about to embark on an epic journey of happy families and move into a house with my boyfriend and get a mortgage. Ive kept the same name. Today we had a bit of a late start at 1330. We checked out the other pub for lunch when we arrived which had loads better options and was also cheaper and cleaner. Winner. U had a bottle of cider with my dinner something I later regretted as I sat through a Library induction. Considering it was a library induction we didn’t go into the actual library to have a look round. The induction was a basic power point of how to use it and I do admit that I still don’t have a clue. We spent the late afternoon wandering round the middlesbrough institute of modern art meeting the curators. A gallery that I have had a drawing displayed In when I was 1 of 50 participants for the chorus project. Again I got distracted by shiny things.. this time it was a jenny holzer piece. Fantastic work. And then due to studying in the city of fog we got rained on and drenched on the way back to the car and got stuck in traffic rush hour. I’m currently laid in bed attempting to write this while my eyes do the flight path of slowly down and up again fighting the blackness of sleep that is attempting to overwhelm me. So as I start my journey on completing my art degree, that I started back in 2006, I am filled with memories of that time and the mistakes that I made. 9. New shoes. She above. So today I start my next step, I enroll onto my final degree year at a new university. 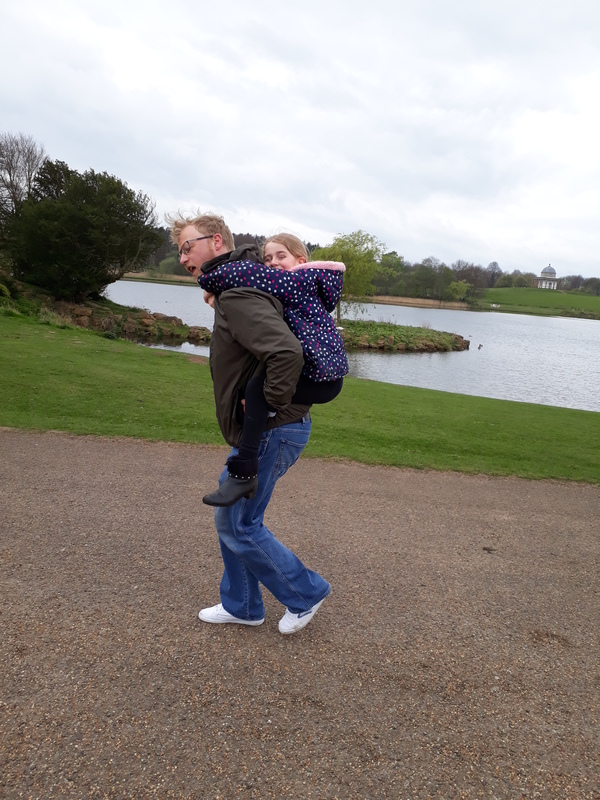 This is my story of the first day updated as often as possible. The daughter is at school, it’s raining and I am very wet. Decided I’m gonna wear comfort over style today so I opt for my jeans and hoodie and some nice comfy (paint covered) black boots. After over thinking things I decide that I need my war face on (make up). I generally don’t wear make up as I simply don’t feel the need to, however today I will be (hopefully) meeting alot of new people, and I have found that a woman with no make up on are often looked upon as overly confident and it makes other people (mainly other woman) feel insecure. Waiting for my carpool guests to arrive before I set off I listen to a whole host of sexist male jokes spewing from the only male in the groups mouth whilst he tries to calm everyone’s nerves including his own and giggling along with him knowing full well it is meant in jest and replying with get out my house you male pig. So after completely ignoring the fact that I was going to return to my degree, for the entire summer I am now sat here all student like. One leg slung over the arm of the chair leaning back against the other side; sipping a hot mocha; wearing my cosy new hoodie, with the school logo on, proudly; whilst conversing with my friends who are joining me on the epic mission of life. My nerves are on the edge of their seat. I have no idea what to expect from the day as each university is different. We are literally sat in the nearest dryest place to our registration point. Am I excited for the journey ahead or completly nervous about joining this new university on the final year of the degree? Registration was very straight forward. Hand over identification and acceptance letter, get given back a new student card. 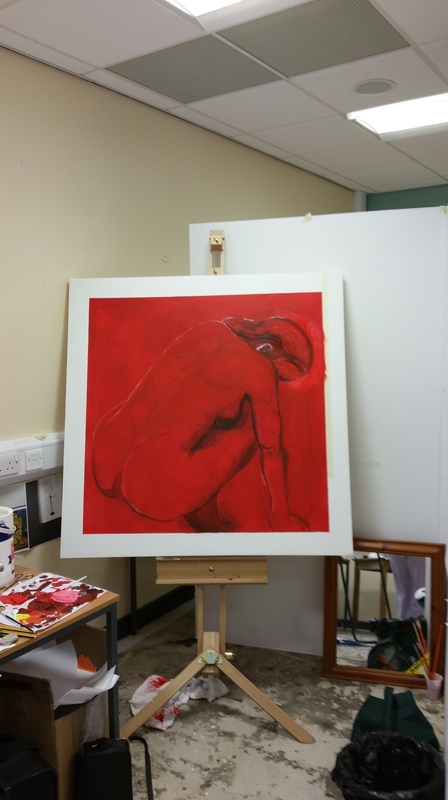 I am now officially a fine art degree student at Teesside university. My nerves and anxiety gave me a sudden boost of adrenaline and I currently feel like I could run a few miles. After quickly looking around at the MA exhibition we decide to grab some lunch. We head back to the pub we claimed when we arrived and find a rather short menu which without our student loans we (I) can’t afford. I’ve been really itching to get in the library. After spending 2 years at the local college, which has such a small library without a single feminism book, I find the current one a bit overwhelming. Everything is number coded not a label in site. We haven’t had our library induction so we cannot use the computers to find certain books yet so I head off for a wander through the stacks and stacks. All put so closely together that u cannot pass in the isles over 2 large floors. I found an entire section dedicated to feminism and the opposite masculinity. In the final section of the library all the art books were found although I have noticed quite a few scattered between the shelves and biology would be a good stop off for research to. Yes I am a geek.. I am a degree student after all how can I not be. I spent the rest of the afternoon sampling the freshers fair. Filling my stomach with free pizza, sweets, cookies, cola and spring rolls. Picking up a free tshirt and loads of leaflets that will most likely go straight in the bin when I get sorted. I am looking forward to my free greggs lunch tomorrow. The adrenaline has left my body and the anxiety has passed and I am now left exhausted faced with a messy house from the final summer Weekend booze up with the besties and lover. Thankfully I don’t have to deal with the terror of leaving home for the first time and living in halls this time round. I spent a good part of the summer getting aquainted with the city so I have become quite accustomed to it. I just can’t wait to get my studio and get started on my work. 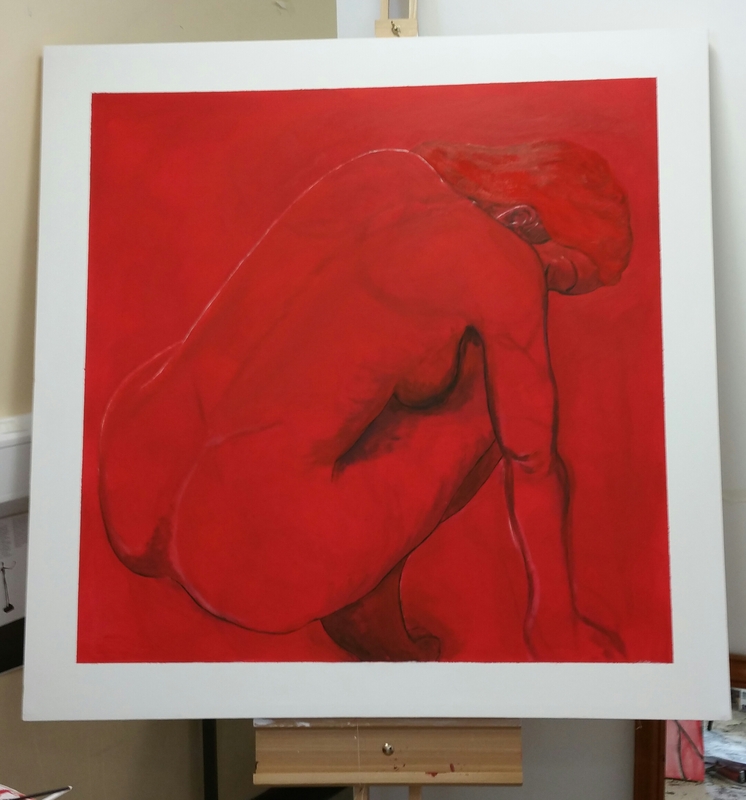 By creating the frame on the canvas but not painting the full figure into the frame the form becomes not fully confined, a woman is not defined by her physical appearance so I have been deliberately framing my images in respect of this. 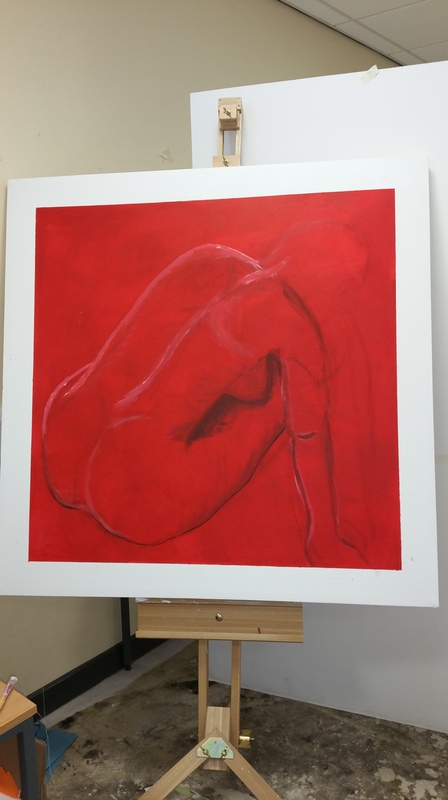 I dislike creating a boundary for the female in my work, positioning her fully within the canvas, as it traps her onto the canvas. 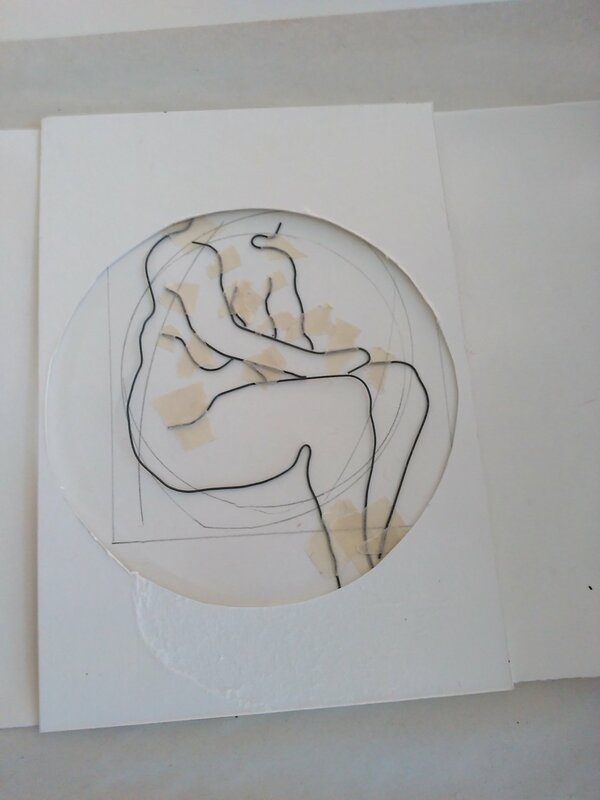 The white square contrasts against the curves of the female giving it an aesthetically pleasing arrangement and frame but also highlighting the difference between a man made frame and the organic shape of the figure. Instantly recognised that the figure was not the correct composition for this painting. 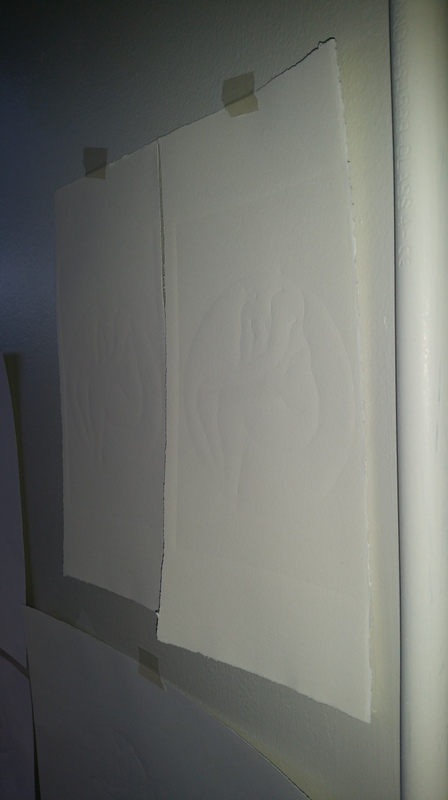 the embossing drawing that I was going to work from. The figure that I decided to work from. my colour palette for this painting is acrylic cobalt blue, white and ultra marine blue for depth. Continuation of lady on red. The proportion of the head to the body was incorrect so I have enlarged it but I am struggling to get it correct. I am wanting the head turned into the shoulder to give her a look of shyness. The curve of the spine was too low so I positioned it higher and flattened out the back and increased the size of the breast. The arm is just suggested line as anything more and it will be a distraction from the form. The hair of the lady needs texture but adding too much will be distracting and too little will look flat. I solved this by adding in contrast then obliterating it with another layer of red paint which simplified it. 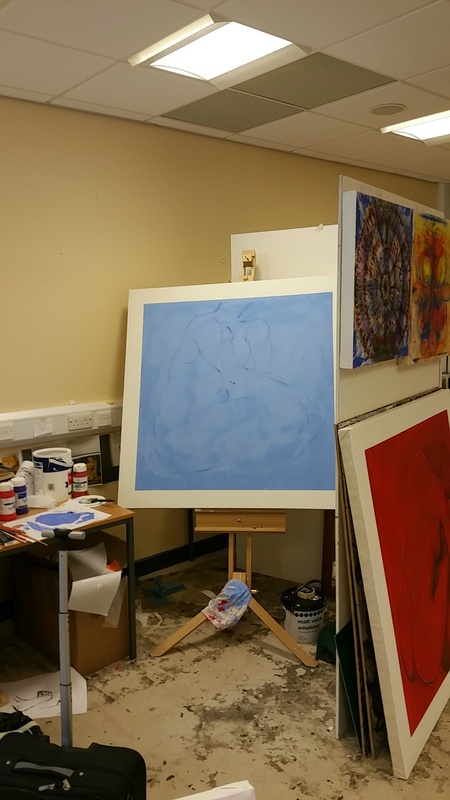 I finished the week by planning and building a canvas for another painting of the same size and style but in blue as a direct contrast to the warm red. 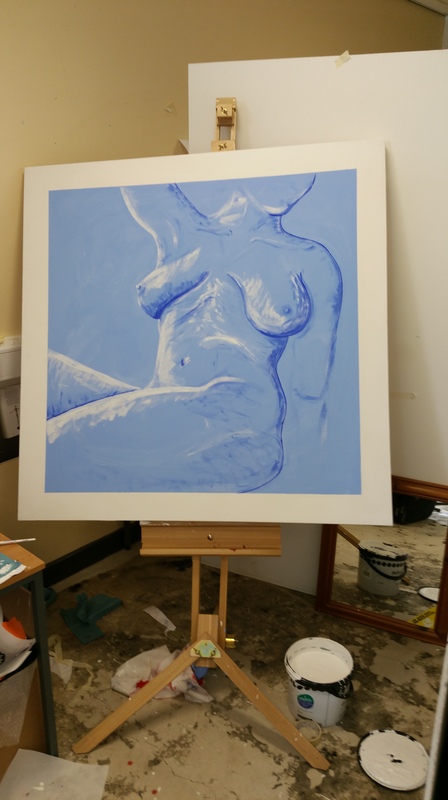 After concentrating heavily on mono printing and the female form I decided to have a very in-depth think about what I am doing and why. 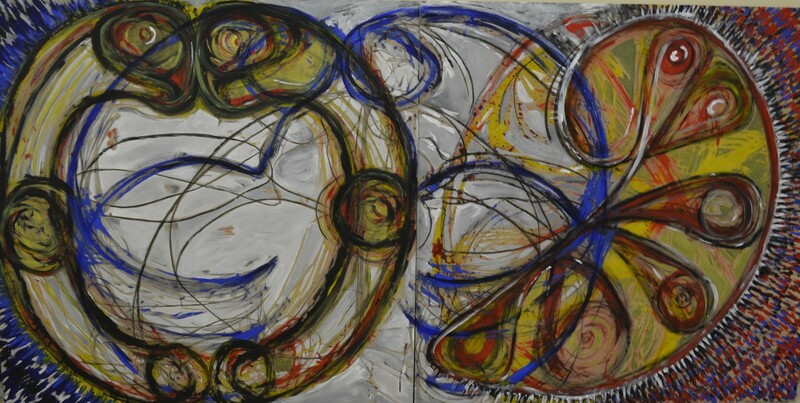 Currently I am very drawn to the contrast between a square and a circle. 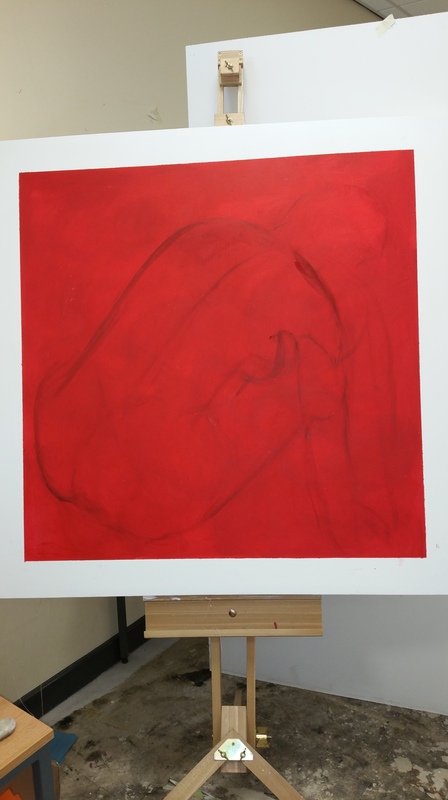 I am attempting to recreate a print, that I created last week, onto canvas. 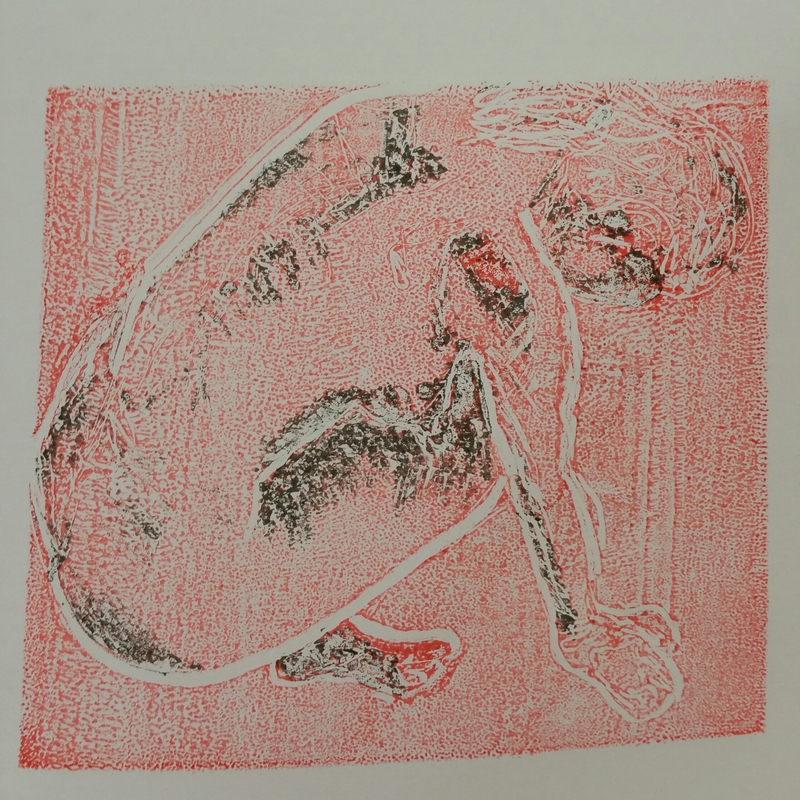 The red square on white of the print worked very well in the print. 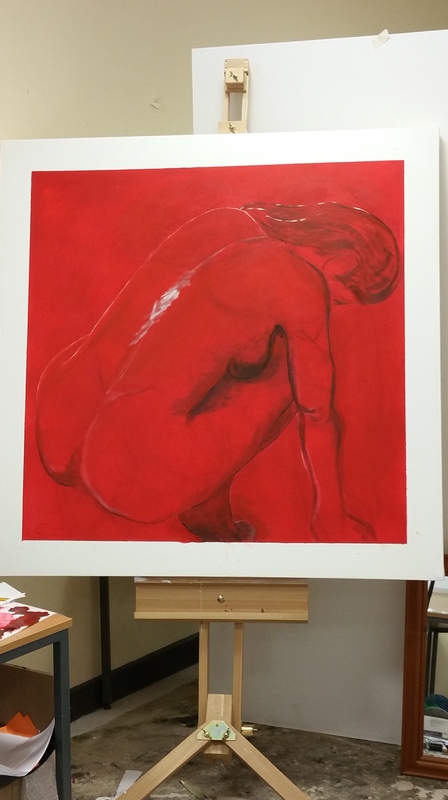 Having the background the same colour as the body helps create a lack of definition for the female from the background. Having the solid colour as a background and then working into it also saves time blocking in areas at a later date and gives a fuller picture faster than starting with just line which works well with mono printing. I have drawn the figure in so that all the lines direct the eye to the head. 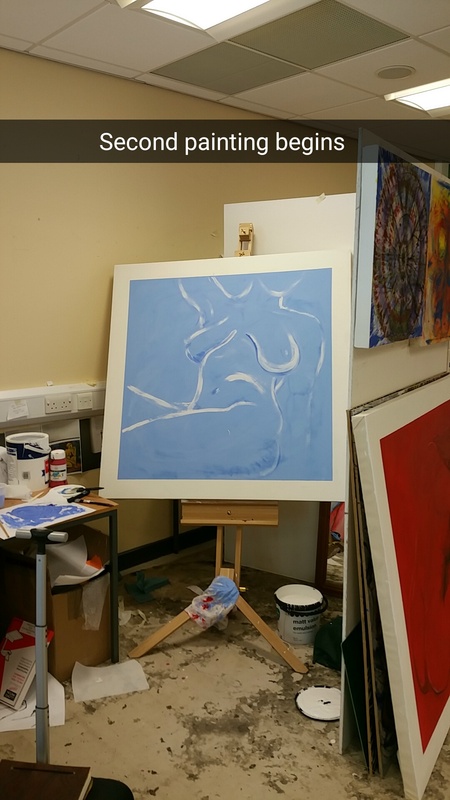 I am keeping my painting quite simple and suggestive rather than photographic as that is my chosen style, and it is not meant to be fully representational.